A wide variety of methods were used to identify where exactly do GPCRs bind arrestins. Experiments implicated large part of the concave sides of the two arrestin domains and identified surprisingly few residues on this extensive surface that determine which receptor does each arrestin prefer. 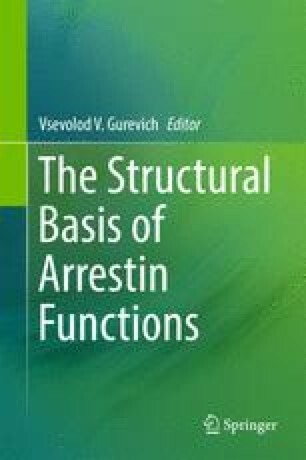 Manipulation of these “receptor-discriminator” residues in one of the non-visual subtypes, arrestin-3, yielded non-visual arrestins with greatly enhanced receptor specificity. Targeting particular receptors with arrestin mutants with special functional characteristics, such as the ability to bind unphosphorylated GPCRs, activate or fail to activate select pathways of arrestin-mediated signaling opens the prospect of creating “designer” arrestins to direct the signaling from GPCRs of our choice to the pathways we want.